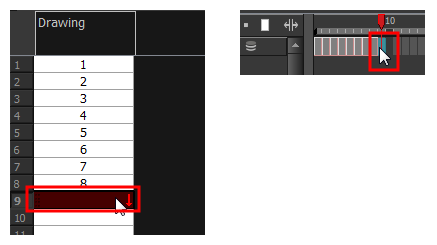 When you copy and paste a selection in the Timeline or Xsheet view, you are not copying and pasting the actual drawings, you are pasting the exposure. Exposure is a property; it is the length of time that a drawing is visible over a series of frames. In Harmony, exposure is independent of keyframes. That is, keyframes are not linked to drawings. Keyframes can be moved independently from the drawing exposure. 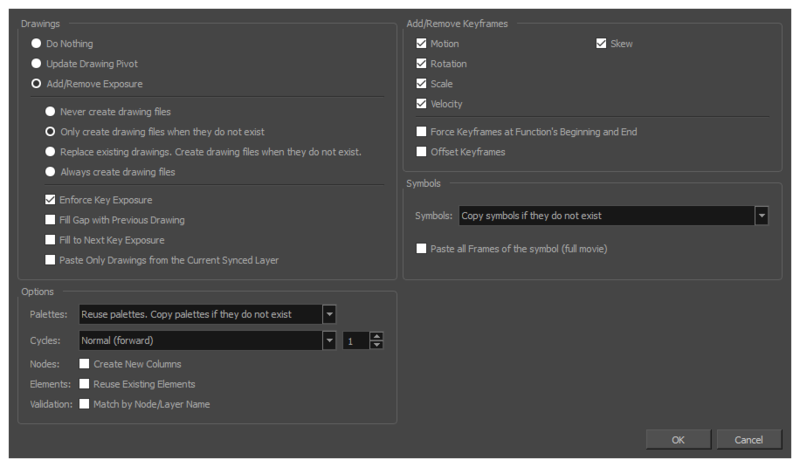 If you want to copy and paste selected drawings into a different layer or paste the selection in the same layer to duplicate the drawings, you must use the Paste Special feature. 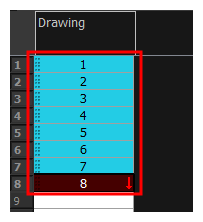 When adding exposures to a drawing layer, drawing files will not be created. If you want to perform another Paste Special operation using the same settings you used previously, you can use the Paste Special Again command instead. You can paste your selection using the same settings as in the most recent Paste Special operation, without opening the Paste Special dialog box. In the Timeline or Xsheet view, select the drawings to copy and press Ctrl + C (Windows/Linux) or ⌘ + C (macOS). In the Timeline or Xsheet view, select the cell where you want your pasted selection to start. Right-click and select Paste Special. From the top menu, select Edit > Paste Special. In the Xsheet or Timeline toolbar, click the Paste Special button (you may need to customize the toolbar to display it). Press Ctrl + B (Windows/Linux) or ⌘ + B (macOS). In the Drawings section, select the Always Create Drawings or Only Create Drawings When They Do Not Exist option. From the top menu, select Edit > Paste Special Again. In the Timeline or Xsheet toolbar, click the Paste Special Again button (you may have to customize the toolbar to display it). Press Ctrl + Shift + B (Windows/Linux) or ⌘ + Shift + B (macOS).